In June of 2001, computers all over the world were introduced to a new concept called Google Earth; or earth mapping. When launched on a computer, you start in outer space and miraculously zoom in. However, the leaders at Google Earth are quick to point out that it’s not just one picture; it’s actually a succession – seamlessly brought together making the transition from a NASA shuttle shot to a satellite shot to a photograph made from an airplane. That’s how it happens, and the human eye cannot detect that. In 2011, NASA and Japan stepped up earth mapping when together they launched the most complete – and free – digital topographic map of the Earth. The Japanese Advanced Thermal Emission and Reflection Radiometer, or ASTER, is an instrument on board NASA’s Terra spacecraft. The map it produces is called a global digital elevation model, and gets its 3D effect by combining two slightly offset two-dimensional images. 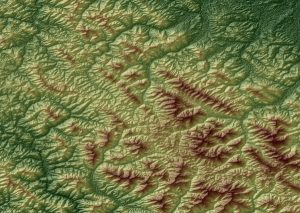 The map, known as a global digital elevation model, was created from images collected from ASTER. So-called stereo-pair images are produced by merging two slightly offset-two dimensional images to create a three-dimensional effect of depth. ASTER obtains high-resolution (15-90 square meters per pixel) images of the Earth in 14 different wavelengths of the electromagnetic spectrum ranging from visible to thermal infrared light. Scientists use the data collected to create detailed maps of land surface temperature, emissivity, reflectance, and elevation. To gather the images, the cameras on-board must be built with a precision lens that offers complete clarity and reliability. Universe Optics specializes in delivering the highest quality lens for your satellite earth mapping equipment. Our team of engineers, along with our manufacturing department follow your design from beginning to end-product ensuring your lens meets your precise specifications. The ability to use satellite imagery in earth mapping has the potential to unlock mysteries on Earth, and into our galaxy as technology continues to move forward.